Aww man... 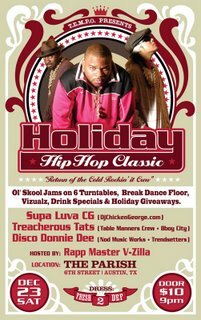 I'm here in H-town trying to figure out what I wanna do for NYE... and Austin seems like it'll be off the chain. 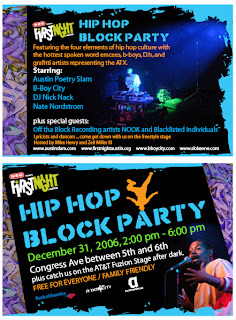 First Night - Hip Hop Block Party with of course the B-Boys... Austin Poetry Slam... DJ Nick Nack... and graffiti artist Nate Nordstrom... with special guests... NOOK and Blacklisted Individuals @ Congress between 5th and 6th... NYE Dec 31st! Here's to a Happy and safe New Years! Nate Nordstrom once stood in the Mojo’s alley, hearing teenagers talk about Sloke’s art. They didn’t know the 32-year-old beside them was responsible. He’s “old school;” Al Martinez taught him the basics in the early 1990s. He tells those who are serious about graffiti to get a mentor, to learn etiquette (don’t paint over someone’s work unless you’re better), to practice so you have more than the bubble letters of your name to put on concrete, to be more than a tagger, to be a writer. Any New Year's plans?!? Me neither. 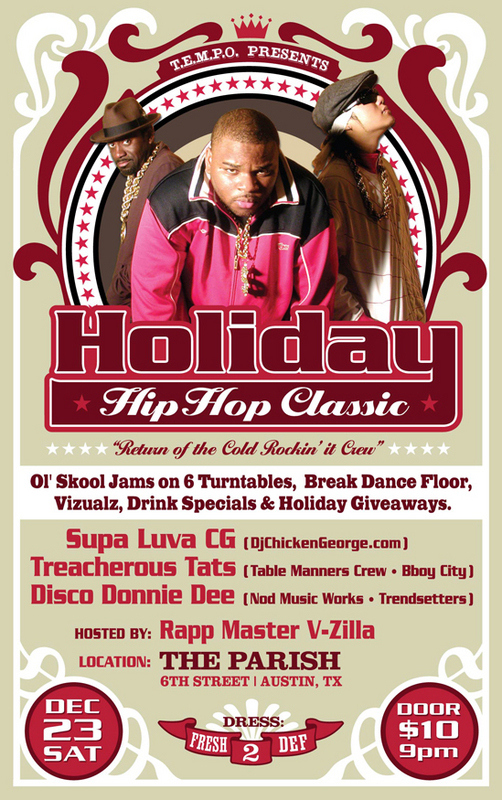 If I wasn't in Houston... ringing in the New Year with B-Boy City @ Whisky would be proper. How's everyone doing?!? Happy Holidays! I've been so busy running around in Houston it's not even funny. Vacation is more work that actual work. One really needs a vacation for their vacation. Insane. The Galleria was so packed yesterday... you wouldn't believe... but lots of cool new shops and gear... and I didn't buy a damn thing! I had no purpose for shopping... and my friend, Ellen, was getting pissed. That's a difference between guys and girls. 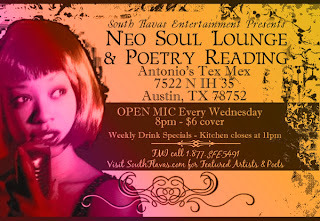 Self proclaimed 512 Don, B-Will will be performing Monday, Jan 1st @ Whisky Bar @ True School Monday's... New Year's Day fools... make it your resolution that you see more Austin Hip Hop next year! Man I drank too much coffee... having heart palpitations. 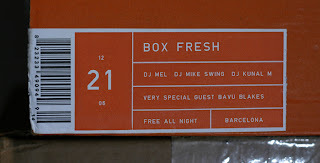 B-Will who's birth name is Byron Williams was born in Austin,TX in May of 86. He fell in lov with hip hop at the tender age of 7 years old when he listened to his dads Geto Boys cassette tape.Every since then the young don has dreamed of being a rapstar. 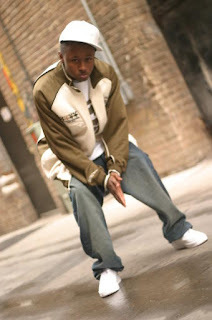 He freestyled in school at lunch tables but really didn't getting serious with music till he was around 16 years old when he got a 8 track and a microphone and started making freestyle tapes and cd's and passing them to friends to spread the word. 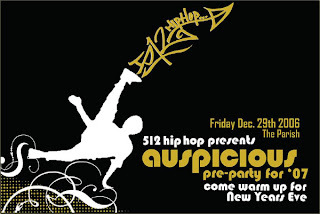 512 Hip Hop wrote in to say that they wanna warm up our New Year's Eve with a pre-party @ The Parish on Friday, Dec 29th. 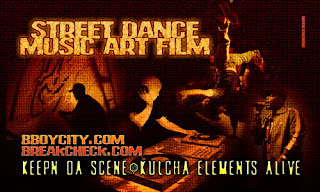 Burnin' your night up with Crew 54, Low Eyes, Meridian Prime, Maestro, and S.T.A.T.I.K. It'll be an auspicious occasion! 1. promising success; propitious; opportune; favorable: an auspicious occasion. 2. favored by fortune; prosperous; fortunate. 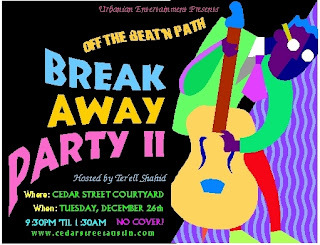 Break Away Party II with members of the D-Madness Project and Mojoe at Cedar Street Courtyard on Tuesday, Dec 26th. Werd... I can breathe now! Headed back to Austin with a job well done. Still alot more work to do, but we've done good. Mission accomplished in Zurich! I feel like I haven't written in like forever. So this is really therapy for me. So... 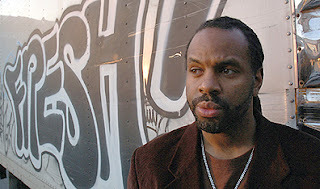 The Word Association along with Austin Hip Hop powerhouses... Zeale 32 and Tee Double. And it's FREE! Werd. You've got to admire these guys for their ability to grow individually and then meld their styles together for a non-stop, heartpounding sophmore album. 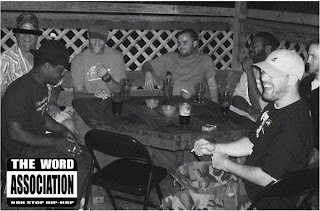 Most of the group members have worked on their own solo projects that showcase each lyricists personal flow and thought-provoking rhymes. The great thing about The Word Association is their drive, their passion and their fearlessness of standing for what they believe in. They say diamonds are forever... grrrls cream over it... crews bling it... peeps ice up their grillz... in the words of Leo... "In America it's bling-bling, out here it's bling-bang." Oh the cheese... I love it. DJ Diamond Tip rubbin' 'bows with Table Manners Crew up at Plush on Saturday, Dec 9th and then at Whisky Bar Sunday, Dec 10th... for a Diamond Studded Weekend. 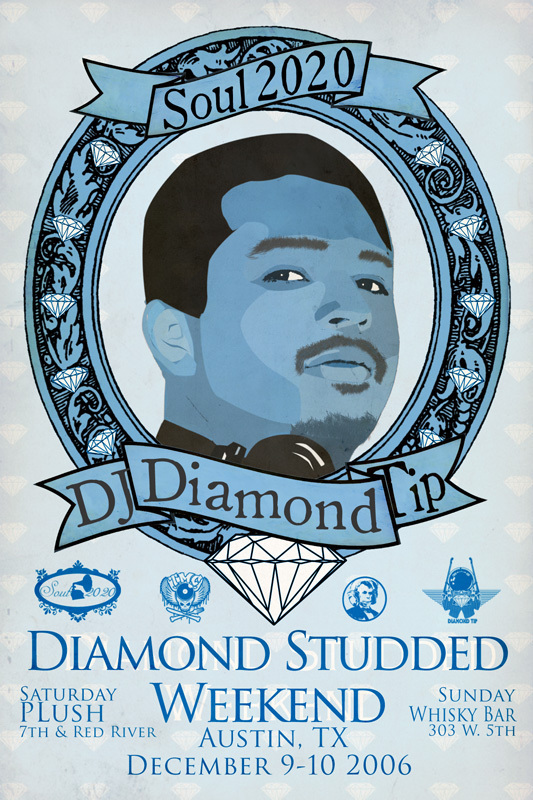 Diamond is the hardest known natural material (second-hardest material to ultrahard fullerite), and is the most expensive of the two best known forms (or allotropes) of carbon, whose hardness and high dispersion of light make it useful for industrial applications and jewelry. (The other equally well known allotrope is graphite.) Diamonds are specifically renowned as a mineral with superlative physical qualities — they make excellent abrasives because they can be scratched only by other diamonds, Borazon, ultrahard fullerite, or aggregated diamond nanorods, which also means they hold a polish extremely well and retain luster. About 130 million carats (26,000 kg) are mined annually, with a total value of nearly USD $9 billion. About 100 tons are synthesized annually.